With opportunities in more than 75 countries and territories, The UPS Store and Mail Boxes Etc. network is the global leader in its marketplace and includes over 6000 locations. Franchisees of The UPS Store are entitled to numerous products and services such as Shipping and Packing, Mailbox and Postal Services, Copying, Finishing & Printing, Packaging, and Moving Supplies, and Business Services that include fax, notary, and office supplies. English proficiency is a requirement for franchise ownership and applicants may be required to take and pass an English proficiency exam. The Mail Boxes Etc. the concept was launched in 1980 as an alternative to the post office. In 2001, UPS purchased Mail Boxes Etc., Inc, and in 2003, the two companies established The UPS Store brand. Because the UPS Store Brand is a globally respected market leader, franchisees will immediately enjoy the public trust and the established familiarity of a nationally recognized brand. Franchisees have the support of local field representatives as well as HQ’s valuable corporate staff. National, regional and local marketing campaigns are designed to increase UPS Store Brand awareness that serves to drive customers to the store. Proven floor plans and established fixture systems adjust to suit any chosen site. 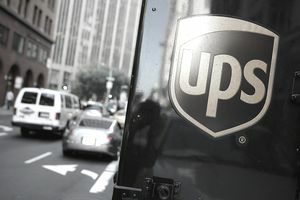 Standardized Design applications keep the franchise consistent with UPS Stores Brand’s established image. The UPS Store Brand Franchise team will perform demographic research to assist the franchisee in selecting store location. How Much Does the UPS Store Franchise Cost? Potential franchisees must have a minimum of $60,000 in liquid capital in cash, savings, stocks, bonds, mutual funds, retirement accounts, a gift from a family member or friend, or any other non-borrowed sources. This amount is based upon the franchisee's area of interest and could go as high as $100,000 depending on market conditions. There is a two-week in-store training session and an eight-day course at HQ in San Diego, CA. The UPS Store brand franchise also offers a lease program that provides financing for newly qualified franchisees. This program includes SBA lenders, assists with the purchase of fixtures and equipment, and is subject to a Department of Corporations California Finance Lenders License. The UPS Store brand franchise has a Corporate Retail Solutions (CRS) department with a dedicated sales force that works with medium and large Fortune 1000 companies. They work with affiliated UPS sales groups to position integrated solutions that drive additional customers to the franchisee. These solutions include Alternate Delivery Locations, returns and exchanges, and other business services in a network system that connects all locations to the corporate office. This link enables franchisees to focus their resources, effectively run their businesses, and to stay on top of emerging industry trends. A sophisticated digital information system allows The UPS Store brand franchisee unmatched tracking and distribution capability. Ranking — Voted the #1 franchise in its category for 19 consecutive years by Entrepreneur Magazine's Franchise 500. Popularity — The #1 most popular franchise with veterans in IFA's Vet-Fran program. Questionable Profitability – According to one report it takes “about $365,000 in annual gross sales” to produce a modest “$35,000/yr income for the owner” and “about 60% of all US stores do not break even.” We suggest you check it out.